Bacteria that could potentially help corals resist the devastating disease white pox have been found by researchers at the University of Florida and Mote Marine Laboratory. The findings could help maintain the health of Florida’s coral reefs, which bring in billions of dollars to the state annually and are important for tourism, fisheries, shoreline protection and pharmaceutical research. 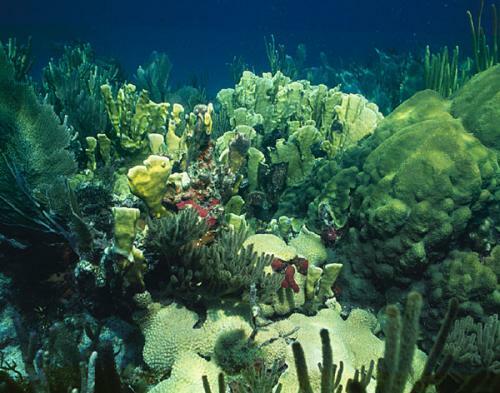 Shallow-water coral reef in the Florida Keyes with blade fire coral, boulder coral, soft corals and sponges. White pox is caused by Serratia marcescens, a bacterium that commonly occurs in feces of animals and is capable of attacking a variety of animals and plants. To combat white pox, Teplitski and a team of researchers began studying the interactions between the pathogen that causes the malady and other microorganisms that live on corals. In the study, the researchers screened several hundred bacteria isolated from coral and non-coral polyps for the ability to help ward off white pox. The researchers found four bacteria that stopped white pox disease progression under controlled laboratory conditions and, to some degree, protected the polyps from getting sick. They also noted that polyps containing the bacteria survived white pox infection, whereas those without the bacteria died. Based on these results, scientists may begin checking individual polyps for the presence of beneficial bacteria before introducing them into a reef system as part of coral reef restoration.